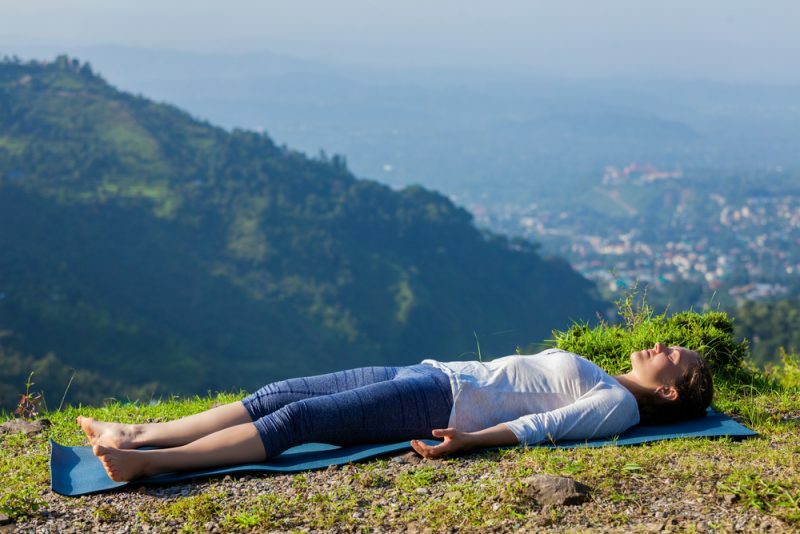 Yoga nidra is a meditative method that is performed in corpse pose (savasana) and is highly beneficial for mental health and the physical body. It helps the practitioner reach complete mind, body, and emotional relaxation by delving into a deeper state of consciousness and turning their awareness inwards. A session can be practiced in a class guided by a teacher, or can be done by listening to a recording in a quiet and comfortable setting. The yoga nidra that is practiced today has its roots in Sankhya, a philosophy that was first put to paper around 700 BC, and expanded upon in the following years. The concept as a meditative practice started appearing in yogic texts around the 11th and 12th centuries. The modern yoga nidra technique as it is commonly known today was developed by Swami Satyananda in the 1960s. He built upon the teachings and practices of ancient yogic philosophy to create a practice that was more widely accessible. This allowed people unfamiliar with yogic texts the opportunity to reap the benefits of the practice. His version allows practitioners to find deep relaxation while also heightening their self-awareness. As the practitioner is guided through these stages into deep relaxation, they begin to work towards valuable benefits that serve the mind and body. These are five of the most significant benefits you can expect with a consistent yoga nidra practice. One of the most talked about benefits of yoga nidra is its ability to promote a better night’s sleep. While nidra does mean sleep, you aren’t actually sleeping while practicing yoga nidra. The practice is referred to as a “psychic sleep”, where you meditate in a deeper state of consciousness. You move from a waking state into a hypnagogic state, which lies between being awake and dreaming. This state encourages alpha wave activity, which is linked with a relaxed state of being. You are still conscious, but in a deep state of relaxation. Researchers have looked into yoga nidra and how it promotes sleep as it relates to sufferers of insomnia. 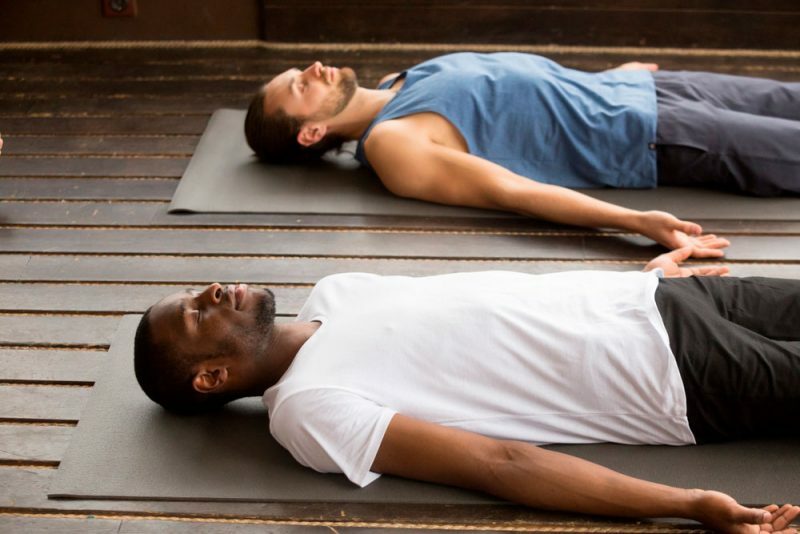 They found that a consistent practice can help people dealing with sleep disorders fall asleep more easily, showing that even those with chronic sleep disorders can find solace by practicing yoga nidra. In addition to helping practitioners sleep at night, many dedicated yoga nidra students use the practice as a tool midday to help them feel awake and revitalized. By meditating in a hypnagogic state, practitioners report getting a boost of energy similar to sleeping for multiple hours. Some even say that one hour of a yoga nidra practice is equivalent to four hours of sleep. The deep relaxing state you are guided into in a yoga nidra session is incredibly effective for helping you cope with even high levels of stress and anxiety. Turning inward and letting your body physically let go helps stress melt away, and the effects of yoga nidra on stress have been widely studied. Researchers studied a group of 80 college students, half of whom completed a 30 minute yoga nidra practice daily over a period of six months. At the end of the study, the researchers concluded that a consistent yoga nidra practice lowers levels of anxiety, and also helps practitioners cope with stress. Another study followed a group of multiple sclerosis and cancer outpatients, who are particularly prone to stress. A 6 week yoga nidra program helped to decrease overall stress levels in these patients. Military combat veterans with post-traumatic stress disorders were also found to have benefited from a practice. The relaxation techniques helped them deal with rage and anxiety symptoms associated with the disorder. Veterans with sexual trauma were also found to similarly benefit. Regardless of whether you have relatively low amounts of daily stress, or are managing your way through a high-stress situation, yoga nidra will allow you to cope with the anxiety and decrease the impact of stressors on your life, which can often put a physical toll on your body. A yoga nidra session helps you do the inner-work necessary to reprogram any negative thought patterns you may experience in your daily life. In a practice, you are guided to create a sankalpa. The word kalpa translates to “vow”, while san refers to a connection with one’s highest truth, so the word roughly means “a vow and commitment we make to support our highest truth”. It is similar to the concept of setting a an intention at the beginning of a yoga practice or meditation. It helps you center in on what you want to work on or enhance in your life. By using a sankalpa, you are working towards adjusting negative thought patterns. A sankalpa helps the practitioner approach their day and life with a more productive outlook. Rather than ruminating on negative thoughts, you learn to approach your life with a positive mantra. Dr. Richard Miller, creator of a yoga nidra method called iRest, explains that this short statement can take on two forms. The first is the “heartfelt desire”, or a statement that can describe your true nature. The second is a more specific intention that will help lead you on the right path of achieving a goal you have set. Regardless of the type of sankalpa you set, it should be said in present tense, as if it has already been achieved. Some examples are: “I am patient”, “I am at peace”, “I release fear”, “Creativity flows through me”, or “I feel relaxed and centered”. Yoga nidra helps you work on your life on the mat through a sankalpa, so that you can bring change to your life off the mat. The practice of yoga nidra gives you a look into your soul that you aren’t typically able to see when in your waking, conscious state. Through a practice, the practitioner goes into their deeper levels of consciousness, as guided by the teacher leading the session. Here, they are able to confront their fears and desires, enhance self-awareness, and begin transformation in their daily life. Throughout the stages of a practice, the student is working towards releasing blockages and getting to know themselves on a subconscious level. In the opposite sensations stage, for example, the practitioner is guided to envision sensations or emotions that oppose each other, such as hot and cold or love and hate. This stage allows a release of emotions, and can also strengthen willpower. In the visualization stage, the practitioner brings their awareness to a space in front of their closed eyes, which is known as the chidakasha. Here, they are told to visualize certain images or situations, at the discretion of the teacher, which helps them further delve into their subconscious mind and address fears, emotions, or negative thoughts. A yoga nidra practice isn’t limited to those with a dedicated asana or meditation practice. The practice is accessible for everyone, as there are no physical limitations, and it can be performed anywhere. All you need is a quiet space, a device to listen to the guided meditation (or, if you are lucky enough, a class with a teacher at a nearby yoga studio), and some time set aside. Many yoga nidra practices are around 30 minutes to an hour long, but you can find shorter sessions if you are crunched for time, or longer if you really want to delve deeply into the meditation. If you want to get into a yoga nidra practice, you can easily pull up a recorded guided meditation to get started at home. There are thousands of options online that you can search through, but these are a few that can get you started. Yoga nidra is an incredibly beneficial practice that is accessible for anyone willing to put in the time. The first few sessions don’t always go as planned–it’s easy to fall asleep or let your mind wander–but over time you’ll be able to drift into the hypnagogic state and truly feel all that yoga nidra has to offer. If you want to reap the benefits of a yoga nidra practice, start by looking into some of the online guided meditations outlined above. You can easily jump into a practice at any time, so give yourself the opportunity to find deep relaxation, let go of stress, and open a window into your inner self.